For a real treat, explore the San Diego tide pools with nature lovers, which includes most kids. Each visit is a unique and wonderful experience - what sealife can you find today? These tidepools are usually found on rocky shores that are covered and uncovered by the ocean tides. Kids of all ages love to explore. Sand...water...rocks... and see some marine life. The San Diego tidepools are best explored during the winter and low tides, in December through March. Guided tours are offered by naturists at the Point Loma tidepools by the park service, and at some La Jolla tide pools by Scripps Birch Aquarium (information below on this page). San Diego Aquariums | San Diego Tide Charts | San Diego Tide Tables | What are Tides? Each time I visit any San Diego tide pools, I see something different. Anemones, sponges, starfish and more. 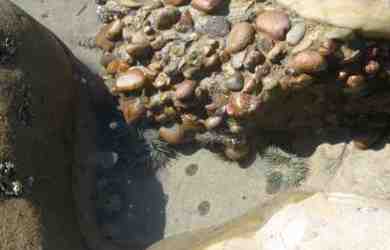 If you visit the Point Loma tide pools, a ranger or volunteer can help you identify what you see. Low tides are a great time to explore tide pools and access the hidden San Diego beaches at low tide. The best time to see the San Diego tide pools are in the fall and winter, when minus tides occur - very low tides that are below the average. Tides are the alternating rise and fall of the sea level, due to the gravitational pull of the moon and the sun. Many factors influence the tides, but the very low tides in San Diego during daylight hours occur during the fall and winter. Tides can be predicted and the San Diego Tide Chart shows the predicted high and low tide for each day. Always use good judgment, as the weather conditions that day can also influence the tides. Note: if you are visiting the tide pools at Point Loma, they close at 4:30 PM. The tide pool season begins in the fall and lasts until early spring. When is the best time to visit the San Diego tide pools? Here are some of the best dates and times. Which San Diego tide pools are the best? I like the ones at Cabrillo National Monument, and the ones in La Jolla the best. In general, they are better in the southern part of the county. But you can find interesting sealife at all of these tidepools. Ocean Beach - Under the Ocean Beach Pier at the end of Newport Ave. is a small tidepool area and sandstone rocks to explore. Tourmaline Surfing Park - At the north end of Pacific Beach, head north to find many tide pools in the sandstone and cobblestones. This is frequented by local biology students. Shell Beach in La Jolla - This small beach is close to Seal Rock Reserve, an offshore rock full of seals and sea lions. At minus tide you can explore the tidepools at the south end of Ellen Browning Scripps Park in La Jolla, San Diego CA. Dike Rock in La Jolla - Just north of Scripps Pier is another favorite area of biology students that is part of the La Jolla Underwater Park marine reserve. 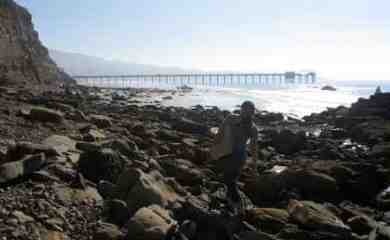 You can park at La Jolla Shores and walk north along the sandy beach then over a rocky area. This is quite a large area to explore. Be careful - the rocks are slippery! Tide Park in Solana Beach - Tide Park beach offers a nice view of the ocean as you climb down the steep stairs, then head north past the sandstone bluffs until you reach a small rocky tidepool area (shown above at high tide). It is officially located in Solana Beach (Tide Park beach access at 302 Solana Vista Drive, a block west of 101. Alternatively, this can be accessed from Cardiff State Beach, as it is a short walk from the south end of the Cardiff Seaside parking lot. Check out the mural of the north coast etched in the sidewalk on your way. Plenty of parking in the lot and a good choice if you have a California state parking pass, otherwise it is $10. Some free parking available along historic 101. Swami's in Encinitas - Swami's is just off historic 101 in Encinitas, south of the gold colored domes of the Self Realization Center. Descend the wooden stairway and the rocky area with tide pools is a short distance to the north. 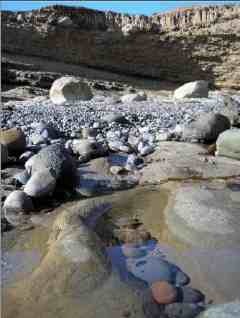 San Onofre State Park - Just north of the campground is a cobblestone tide pool area. To the south and at the base of the bluffs below the campground is another rocky area to explore. Located in north county of Interstate 5 freeway off Basilone road just north of Camp Pendleton. Birch Aquarium at Scripps offers guided visits to La Jolla tide pool to learn how these amazing habitats and their inhabitants truly survive "between a rock and a hard place." Scripps trained naturalists will show you how to tread lightly during your visit and help you discover the great world of tide pools. 1. Wear non-slip shoes. Rocks and algae can be very slippery. 2. Watch young children carefully so they do not hurt themselves or the inhabitants of the tide pool. 3. Arrive early on weekends or holidays, as the tide pools may be crowded in popular spots like Point Loma Cabrillo National Monument. 4. Avoid stepping on animals. 5. Carefully turn rocks back over after you have moved them. 6. Don't remove any attached animals, such as barnacles or sea anemones. 7. If you pick up animals such as crabs or snails, return them to the same tide pool where you found them. 8. Remember, this is a fragile ecosystem that deserves your protection. Do not injure any animal in the tide pool.